From icy caves in SnowCastles to breathtaking underwater dining, we have compiled our own list of the globe’s most inspiring restaurants. Recently voted number one in The World’s 50 Best Restaurants, EMP as it is affectionately known by fans is also the holder of three Michelin stars. This contemporary, modern restaurant is currently offering an 11-course retrospective tasting menu showcasing some of the classic dishes it has served over the last 11 years. Co-owners Will Guidara and Daniel Humm have further big renovation plans for the venue, due to take place later this year. To see it in its current form you have better visit now! Made entirely of snow and ice, the SnowCastle hosts the world’s largest SnowRestaurant. Pure white show walls encase this atmospheric venue which is only open during the ski season. Eat at an ice table and drink from ice cups seated on a hide covered bench in artful snowy surroundings that are kept at a constant -5C – wrap up warm though. On the 38th floor with breathtaking views over Tokyo city, this acclaimed sushi bar combines age-old traditions with a distinctly modern outlook. An 8- seat dining counter fashioned from 350 year old Japanese cypress and floor-to-ceiling windows. Master Chef Yuki Imaizumi transforms the most simple nigiri or makimono-rolled sushi into culinary masterpieces. With 27 staff serving just 12 guests the best ingredients in the most spectacular way, the buzz surrounding double Michelin star chef Paco Roncero concept restaurant Sublimotion is about more than just the €1500 per head price tag. Housed in the Hard Rock Hotel, Ibiza, diners are served a set menu as images are projected onto walls and multi-sensory elements introduced. Now in it’s fourth season the kitchen team boast no fewer than eight Michelin stars and the theatrical team includes talented professionals from circus, illusion, film and music. Chef Roncero calls is ‘the cheapest life-changing experience you can have’. Perla is located within the historical conch shell of La Concha Hotel which was designed by Mario Salvadori and sits on an infinity pool elevated above the beach. The dining room is illuminated by eight Murano artichoke lamps and the surrounding pool creates a reflection of water dancing on the ceiling. Chef Lindell Smith is committed to providing his guests with an incredible dining experience through both food and service. Das Stue has been called by Forbes ‘The coolest hotel in Berlin right now’ but the icing on the cake of this venue has to be Cinco. Paco Perez holds five Michelin stars across his three restaurants and this confidence is evident in the avant-garde tasting menus offered at Cinco, reaching up to 17 courses. 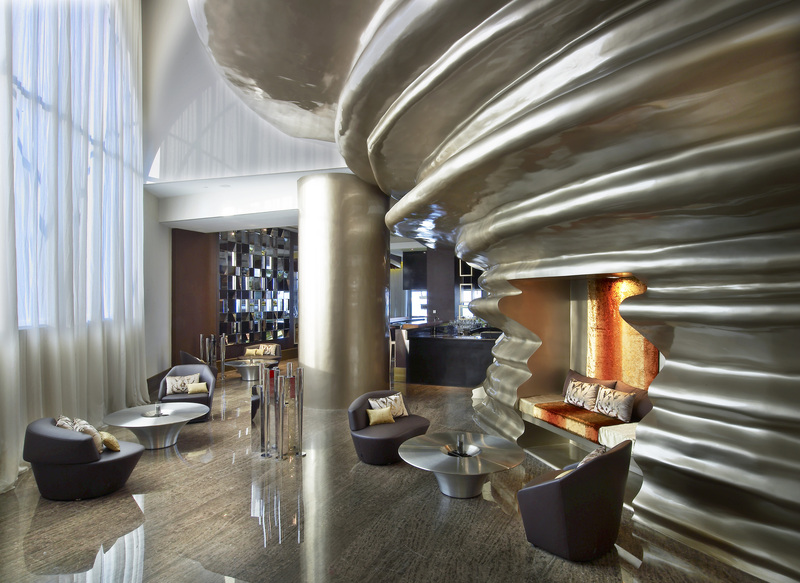 Designer Patricia Urquiola has characterized the public spaces with sober architecture highlighed by dramatic contemporary details. Cliveden is one of the world’s grandest and most luxurious hotels. A Grade I listed Italianate stately mansion set in a 375 acre estate presided over by the National Trust, it was once the home of the Astor’s and the location of the notorious Profumo Affair in the late 1960’s. The hotel’s motto is ‘Nothing ordinary every happens here, nor could it’. The spectacularly beautiful grand dining room is now home to the talented André Garrett and his innovative dishes, fastidious preparation and immaculate finishes shine through in each crafted creation. The view over the estate and down to the Thames is undeniably one of the most outstanding views in England. If a chef is judged by the strength of his customer reviews, then Mauro Colagreco, Chef Patron at Mirazur is one of the best in the world. Set in a landscape between the mountains and the sea, Mirazur has view over the harbour of Garavan. Perhaps Colagreco’s most celebrated characteristic is his ability to seamlessley marry the land and the sea. With the pick of Italian and French markets his two Michelin star menu showcases the best of both locales and the restaurant set over three levels offers panoramic views over the Bay of Menton. At the heart of the culinary experience that is The Grillmarket is Iceland’s pristine nature. A close working collaboration with dedicated local farmers has produced a menu that is a magical fusion of tradition and modern cuisine, where ingredients such as quail and honey take centre stage. The moody interior scheme, with exposed stonework and huge slabs of polished tree trunk, work alongside drop lighting and local materials (tanned skins, spotted wolffish, columnar basalt, moss) and it is considered one of the most popular restaurants in Iceland. 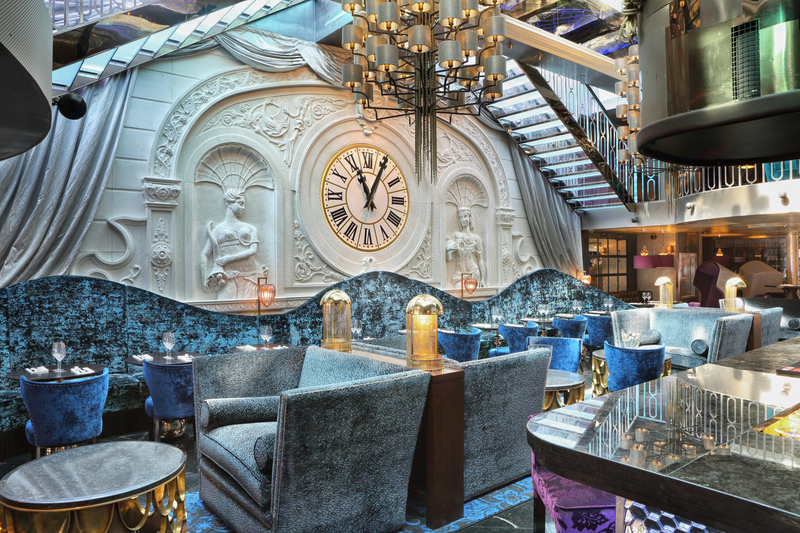 Designed by Rockwell Group Europe, the restaurant is named after the hotel chains found John Jacob Astor IV. The first thing that hits you on entering is the incredible 16-foot tall sculptural installation which wraps across the whole of one wall in spun-bronze, a tribute to the works of British artist Tony Cragg. Resembling smoke frozen in space it provides a visual contrast to the main dining area which features a dimensional landscape of pine wood pieces hanging from the ceiling. An open kitchen provides guest the opportunity to watch award-winning chef Roudy Petersen prepare dishes. This much lauded three Michelin star restaurant’s new look, designed by Patrick Jouin and Sanjit Manku, subtly evokes the Rivera’s art vivre. Centrepiece of the space, the ‘Office’ stands in the middle of the dining room – a bold decision as it stages service actions normally hidden from the public gaze. Also at the centre is an enormous chandelier, seven metres in diameter containing seven hundred pieces of glass assembled by hand. The menu, created by Alain Ducasse, one of the world’s most awarded and talented chefs, and Dominque Lory, is assertive and modern showing exactitude and precision of taste. Often included in articles about ‘best-designed’, it is easy to why Le Pain Francais’ renowned interior has caught the eye of locals and tourists alike. With a modern kitchen and roof top terrace it is one of Gothenburg’s largest restaurants seating over 400 across four floors. Part of a successful chain of French-inspired cafes, the design concept is the work of Stylt Trampoli. All of the different sections of the restaurant have names. The entrance is Porte de Paris, the middle section with the great clock and DJ station in a hot air balloon basket is the Place de Trocadero. Beyond lies the Boudoir, a cosy nook made for intimate dining. One floor up the Chambre des Curiosities has a row of Gothic cabinets filled with French flea market finds, and the top floor with glazed in terrace is Jardin Secret. 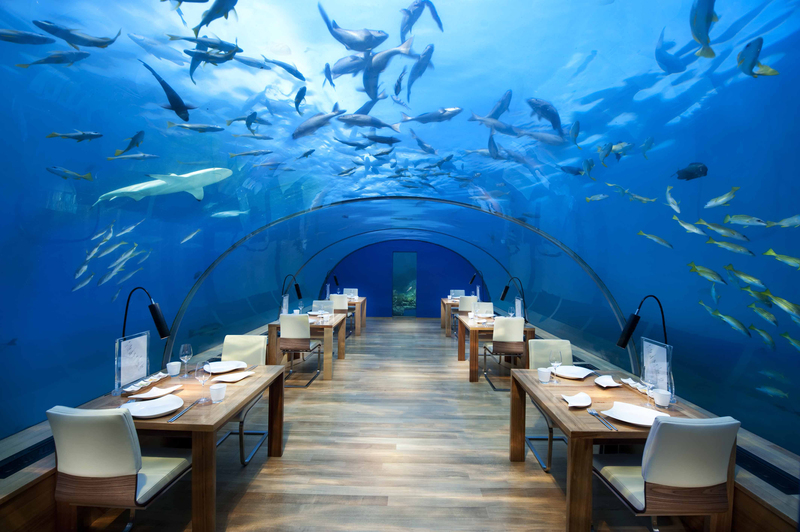 Rated the ‘most beautiful restaurant in the world’ by the New York Daily News, Ithaa sits five metres below the surface offering 180 degree panoramic views of the vibrant, coral gardens surrounding it. Ithaa (meaning ‘Mother of Pearl’) serves a contemporary European six-course set menu along with indulgent fayre such as caviar and cocktails and can be booked for private events. Considered Scotland’s finest Country Hotel, the 19th Century Inverlochy Castle is rich in landscape and history and sits on the side of a loch, nestled in the foothills of the mighty Ben Nevis. During a trip to Balmoral in 1873, Queen Victoria spent a week at Inverlochy sketching and painting and she wrote in her diaries ‘I never saw a lovelier or more romantic spot’. With the legendary father and son team of Albert and Michel Roux Jr taking over the helm of the kitchen, it is also a culinary experience to savour. Each of the three dining rooms are decorated with period furniture presented as gifts to the castle from the King of Norway, creating a unique experience and unrivalled surroundings.